3 Tips to Get Your Marketing Plan to Stick! Here are some time saving and manageable ways to get you and your team working the plan. So grab a coffee, and a few minutes to see what ideas might help you put your plan to work. Just the other day, I read a stat that 80% of New Year’s resolutions fail by February. 80%!! What a staggering statistic when you think about all the good intentions and efforts that go into starting the year off right. A marketing plan can be like a New Year’s resolution. It will fall to the wayside if you aren’t investing the time to make it a working plan. It is so easy to lose sight of the important things and get caught up in the “needs of the moment”. The task of building the plan is a tremendous undertaking and one that requires active steps and a concerted effort to bring to life. Now is the time to be intentional and make it stick. Besides, there is too much good work and thinking in that plan to let it go to waste. 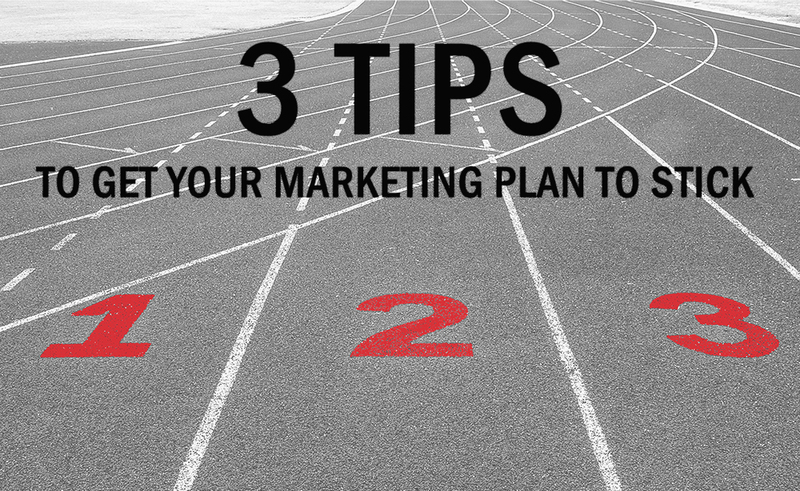 Here are my top 3 tips for getting your marketing plan off and running. I like to call it plan the work – work the plan (P.S., I didn’t invent that, I just love it). This is the time of year to get to work on working the plan. How are you tracking the work? Have you created a detailed account of deliverables, key dates and project owners? Consider what technology solutions are available to you or that you can go acquire to help you track plan milestones. These tools are your friends. You can assign tasks and notify task owners. Here at the Posse, we use Asana to manage our projects and set tasks. We can set alerts in the system so that task owners know when a due date is approaching. We also can have “conversations” about the work in the program so that anyone who is involved with the project can stay up to date. The beauty of a system like Asana or Basecamp or any other project management tool is that it forces you to think through the execution of an initiative. It takes some discipline, but once you have identified the tasks and entered them in the system, the execution is much easier and more efficient. Most importantly, when you look at your tasks for the day, you know they are tied to a bigger plan and you are focused on achieving your objectives instead of just “today’s fire drills”. By the way, the fire drills will still be there, but now you can balance and prioritize what needs to get done with what should get done. No technology solution can completely replace face-to-face conversations. That is why even if you have a sophisticated project management tool in place, it is still important to check in with the team and revisit the plan periodically to ensure that it is on track and top of mind. I’ve been in organizations where these meetings can be tedious, long, and people dread participating in them. There are numerous articles and books, to tap into to have a more productive meeting, but I recommend something different. If the objective is to hold yourself and the team accountable and make the plan a priority, then keep it short and simple and don’t be afraid to make it fun. Make it a pizza meeting and focus on results and challenges only. Celebrate successes with the team. Bring leadership along and if you are leadership, check-in with your teams or find ways to show your team that you are prioritizing the work plan too. Now that you have the plan broken down into manageable tasks (that was in tip #1), place some small bets, but stay flexible along the way. The Merriam-Webster dictionary definition of a plan is “a method for achieving an end.” Sometimes you may get into the work and find out that there is another method that should be considered or maybe the end goal is still correct, but the way you are going about it isn’t working. Rather than making a commitment to the plan, commit to the end goal. Flex your methods and place some small bets to see what you can test and learn. Let’s imagine you have a holiday program that starts in Q4. You aren’t going to begin implementing the plan until much later in the year, but there may be things that you could do now to test the plan. Are there some “plan b” options that you should be considering? It is better to find out early that plan adjustments are needed rather than trying to rewrite your program strategy in November. Be ready to adjust based on the business needs and performance. Something will go wrong or at least, not as planned. So, be flexible and don’t be married to the plan, just to the goal. Let’s wrap this up, shall we? It’s February and the year is officially in full swing. It can be hard to stay on task when the day-to-day stuff can sometimes take over. So, make time to work the plan you have developed. First, leverage technology to get organized and be efficient. Second, hold yourself and your team accountable (but make it fun!). And lastly, place bets, but be flexible if you run into challenges or are not getting the results you need. You got this! And P.S. – if you don’t have a plan at all, give us a call…it’s not too late., we are happy to help you get off to a great start for a successful 2019. At The Marketing Posse, we love a good plan. But, we love a good plan that is well executed even more.